RETURNER stars Ann Suzuki as Milly, a young woman who has traveled back in time from the year 2084 to the year 2002. Her mission is to stop an alien invasion before it begins. This invasion will eventually lead to all-out war between the aliens and the humans if Milly isn't successful. 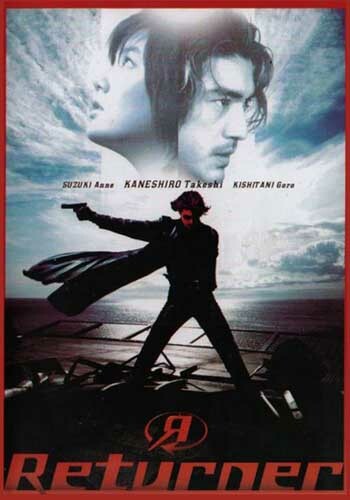 She meets a hitman named Miyamoto (Takeshi Kaneshiro), and convinces him to help her. Unfortunately, Milly's arrival in the past was slightly off and the aliens have already landed, and the evidence has been confiscated by the government. To make matters worse, a gangster named Mizoguchi (Goro Kishitani) is determined to claim the alien artifacts for himself and harness their awesome power. It's now a race against time for Milly and Miyamoto to obtain the aliens and save the future.